The internet has saved many a vegan cook from dreary days of raw celery and baked oatmeal. The selection of great meatless, dairyless, and eggless recipes is endless and overwhelming. It is great when you are given a fool-proof list to get you started and that is what I will try to do! Everyone has a go to green smoothie recipe but this one has white beans... even better! Seems like a delicious, happy accident. A different bowl of oatmeal everyday! Great recipes to eat, clear your pimples and whiten your teeth. And a great excuse to meet the awesome Crunchy Betty! I prefer baking traditional recipes, omitting the eggs and dairy without replacements. Luckily bananas are a perfect substitute for eggs. A creative recipe to "mock" my ultimate breakfast obsession. I love the trompe l'oeil poached egg. Miss the taste of bacon but not the slaughter? 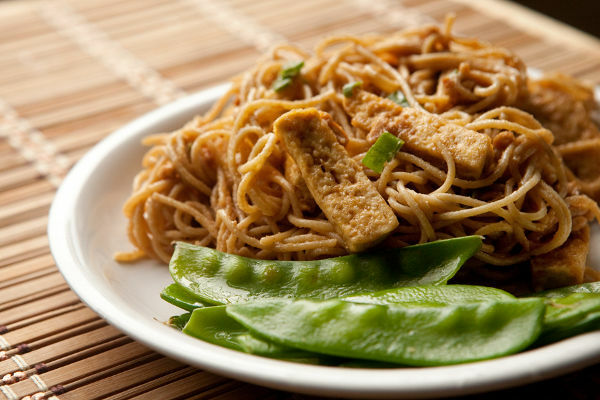 Tempeh bacon satisfies the flavour and crunch. Perfect on FLTs (facon, lettuce and tomato). Even real Vegans eat quiche! From one of my all-time favourite recipe sites, 101 Cookbooks. Sunday brunch is for Vegans! Bake this french toast in the oven while you lounge with your morning coffee and crossword. Could this be any easier? Four ingredients including whatever cereal is in the cupboard. Instant treats! I am picky about scone texture. I like them moist yet crumbly, almost biscuit-like. These orange scones are perfect and can be easily adapted to different flavourings. The secret, use your best recipe, replace the butter with vegan margarine, and don't use the egg (especially if it is a single egg). Yummy, eggy textured with a dilly bite. Great on pumpernickle! Vietnamese street food sandwich. Also, if you sign in to Vegetarian Times you can save your favourite recipes. You know it's a party when she brings out the crab cakes :) This may be residue from having a mum from Cape Breton. Pureed creamy soups are lovely. The colour and taste of carrot soup is invigorating but you can replace the carrots with any root vegetable. Just boil to soften, flavour and puree. Seems like it should be vegan but never is, so make your own oniony, soupy, bready, cheezy goodness. A variation of a recipe from the book Vegan Soul Kitchen by Bryant Terry. Easy and elegant, don't be afraid of puff pastry! PPK is only getting better with Isa's new low-fat recipes. Another great book for my collection. If we can't get to NYC's Candle Cafe then let us make pretty stuffed phylo purses at home. Anything from this site because the recipes are easy, tasty and adorably illustrated! My favourite is black bean and sweet potato but burritos are probably the most versatile vegan meal. Use daiya cheese, conveniently shredded, instead of cheddar. Great appetizer with my favourite burrito dish. You can bake them too! Your annual Vegan Lumberjack party will never be the same! Try this piece of Canadiana with the chickpea gravy. A gravy that will make your dad say, "I thought you were vegetarian!" It is also gluten free! Every good Vegan needs a bean loaf to make their parents proud. Plus it gives one an excuse to eat mashed potatoes and chickpea gravy. The creamy comfort of a rich alfredo sauce is hard to beat. Make a batch of this and freeze it for an instant hug. This lentil pot pie will get you started but this is a great way to reformat your leftover curries, stews and chilis! Wow, your guests with pretty pastry. Cover all your cravings: hearty, saucy and creamy with this traditional greek dish. Prunes in stew? Sounds fabulous! But if you aren't sold, try dried raisins, apricots or even cherries. A hearty stew with chunks of root vegetables in a gravy like broth. This brings me back to the large pot my dad would simmer on a Sunday but better (without the beef). It doesn't get any simpler than roasted veggies. Serve with a salad and crusty bread for an elegant meal. There are never enough casserole dishes to hide all the veggies in. Covered with potato slices, who could refuse? I love Indian spices and bonus that their recipes are often naturally vegan. Potato and cauliflower is the perfect way to ease into the glory of Indian cuisine. Layered pasta and veggies with a creamy cashew ricotta. The most popular kitchen sink recipe: one pot versatile meal to satisfy the most diverse group. Add cornbread or a crust, add macaroni, leftovers as sloppy joes or as a tofu dog topping. You mustn't fear Gordon Ramsey calling you a donkey! Risotto is actually easy to prepare, it just takes a little time and attention. Use this as a base to stuff any veggie (zucchini, squash, tomato, pepper) with any veggie, grain and bean mixture. Prefry these burgers so they stick together and then grill em! Add your favourite burger toppings; salsa and guacamole are mine. The simpler the better: a perfectly ripe avocado, some lime, some garlic, some salt. But for those who need a recipe, here is a good one! The Kind Diet has brought vegan food to the masses. One of my favourite treats from this book is also included in the recipes on The Kind Life website. Avocados! This delicious double chocolate torte is super rich and creamy thanks to avocados. I admit I just love the idea of cats baking cookies. Check out the delightful vegan recipes and artwork at "They Draw and Cook." Canadian comfort food. Make them and then you will understand the controversy. I like mine gooey, no raisins or nuts. Summer berries and pies neeeeeeed whipped cream. This version uses coconut milk but still tastes very "creamy." Everything you love about a donut but baked and vegan. The raw cashews are worth it! This one is also gluten free and sugar free. Pinch yourself, it is not a dream. Don't see your favorite listed? Tell us about it on Facebook. Of course don't forget the fantastic recipes from This Dish Is Veg team members! www.nomeatzone.com The photo above features Katelyn's Peanut and Ginger noodles. Catherine, aka the Goodness Baker, is a graphic designer, artist, writer, blogger, animal lover (especially kitties), traveler, and foodie. She adores her husband and his ability to take her flying and build her home. Catherine loves to cook vegetarian delights, work on cookbooks, illustrations, and fictional stories. Follow Catherine at the Goodness Bakeshop.